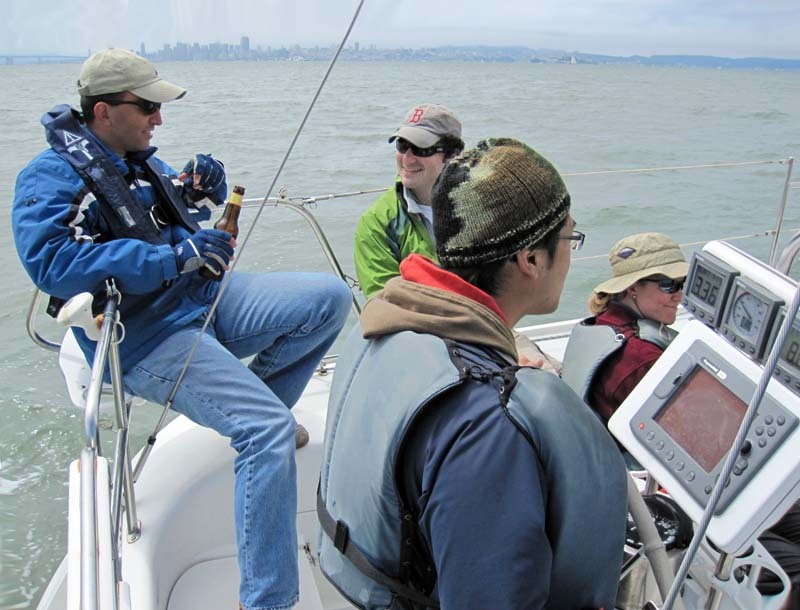 On Sunday, 8/2/08 six of us went sail boating in San Francisco Bay. 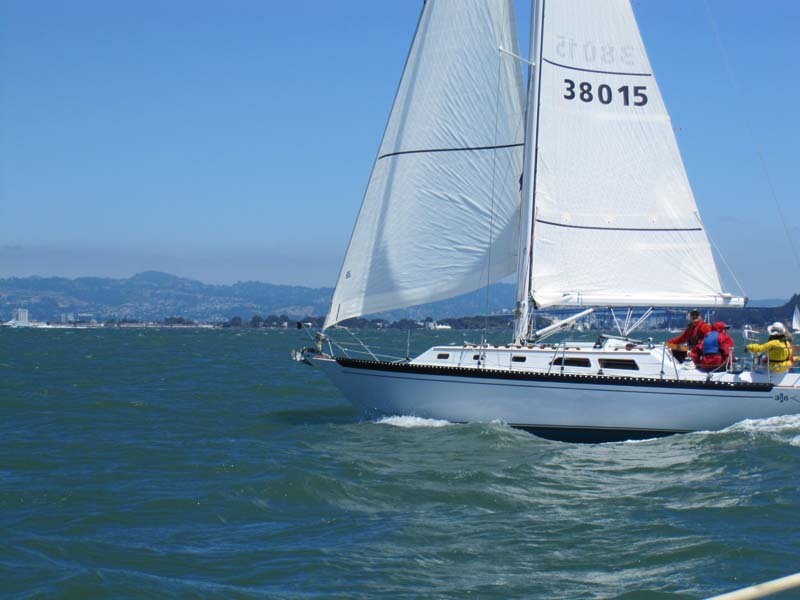 We rented the Catalina 32 Sailboat from OCSC out of Berkeley Marina. Below are some pictures and movies from that day. Click on any picture below for an ENORMOUS version. 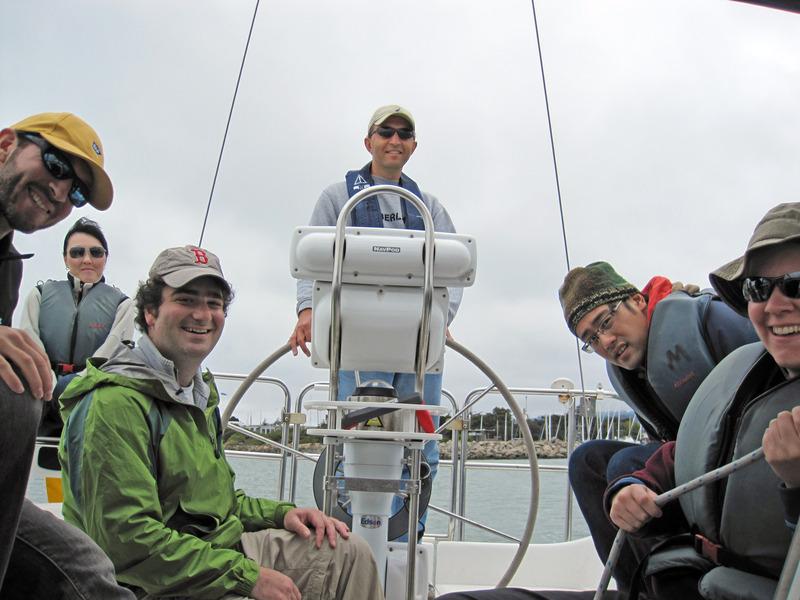 Below is our group, from left to right Gleb Budman in yellow hat, Katherine Chung in back, Philip Zeyliger in the green jacket, Jean-Michel Leon ("JM") at the wheel, Damon Uyeda, and Miranda Dietz on the far right, and me (Brian Wilson) behind the camera out of view. It's about 11am in this picture, and the skies are all overcast in the Berkeley Marina. 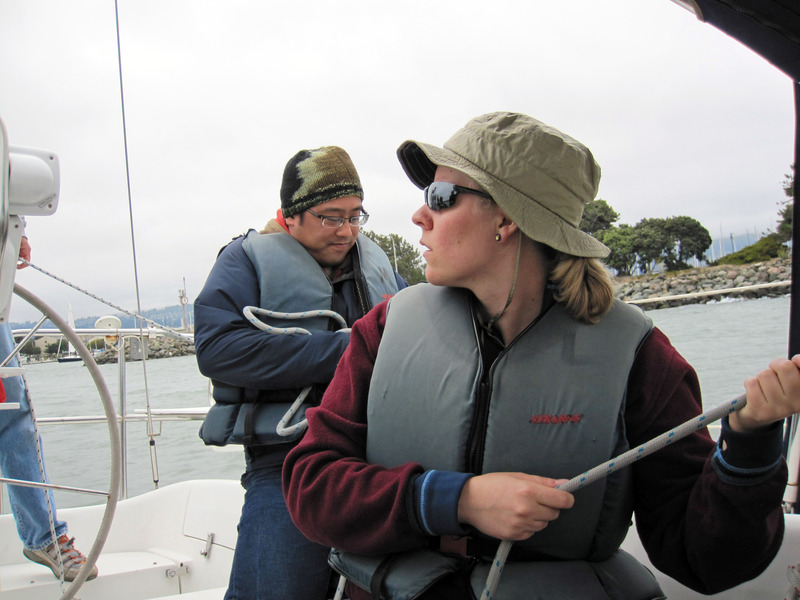 A little practice in the marina, Damon is hauling in a jib sheet and Miranda is awaiting instructions from JM. 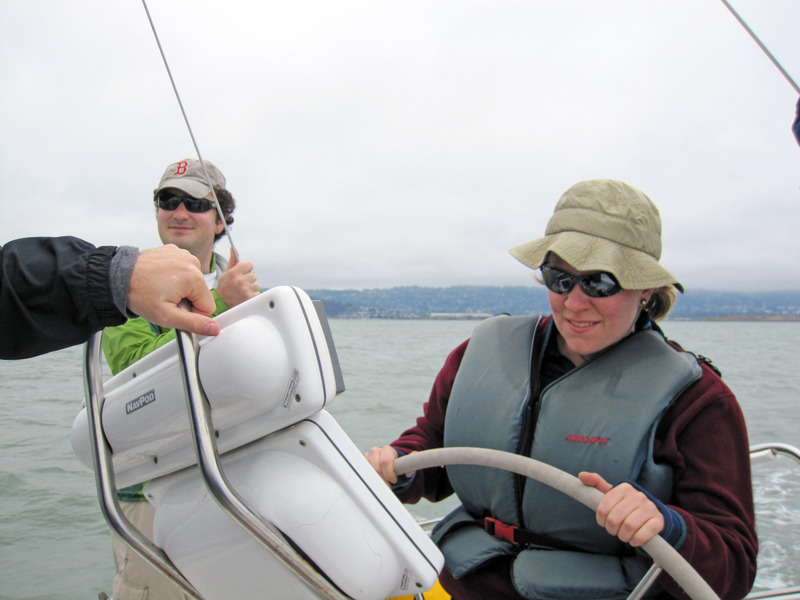 Miranda steers the sailboat as Philip looks on. 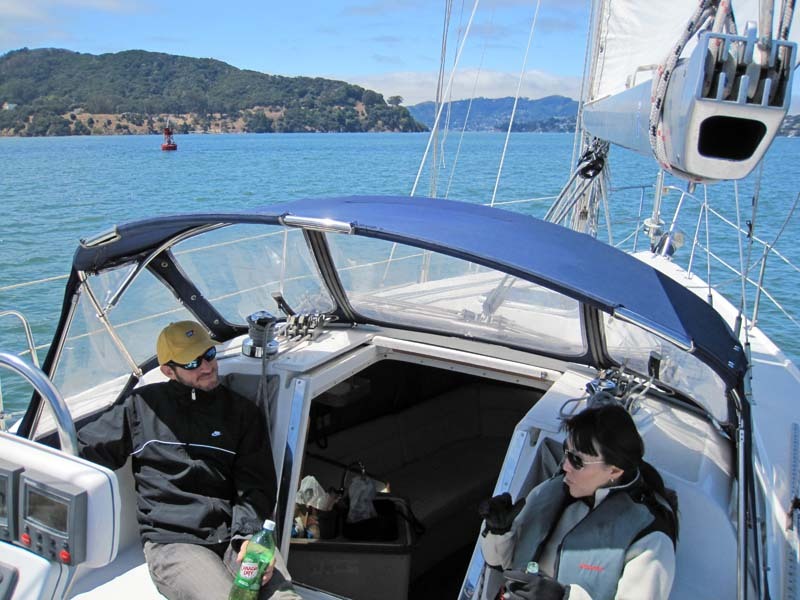 As we headed from the Berkeley Marina over to Angel Island, the weather started clearing up, and as we came into the windless calm behind Angel Island it was noon so we sailed quietly and relaxed along while we had lunch. Below is JM, our fearless leader having a beer, you can see the San Francisco Skyline behind him. Damon is steering the boat. 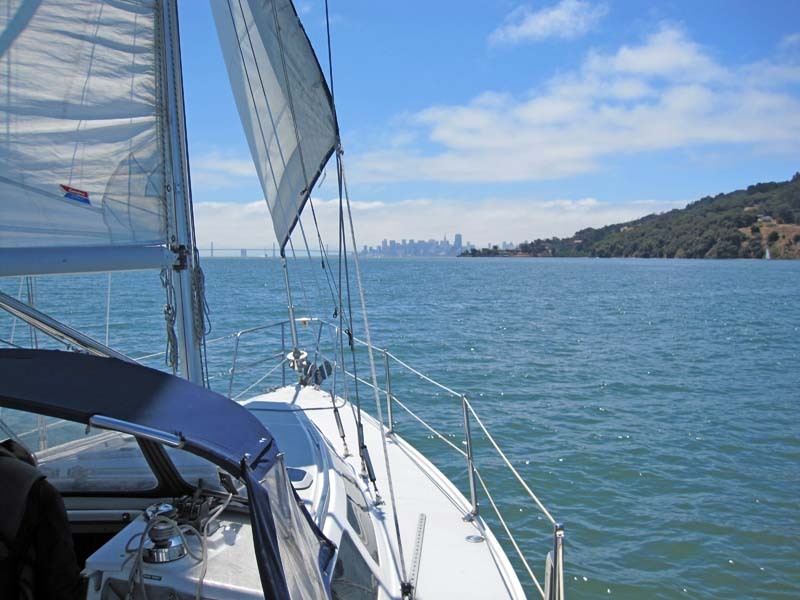 As we come up to Angel Island the weather really broke, it's all blue sunshine while sailing on San Francisco Bay! Below is Gleb and Katherine kicking back. 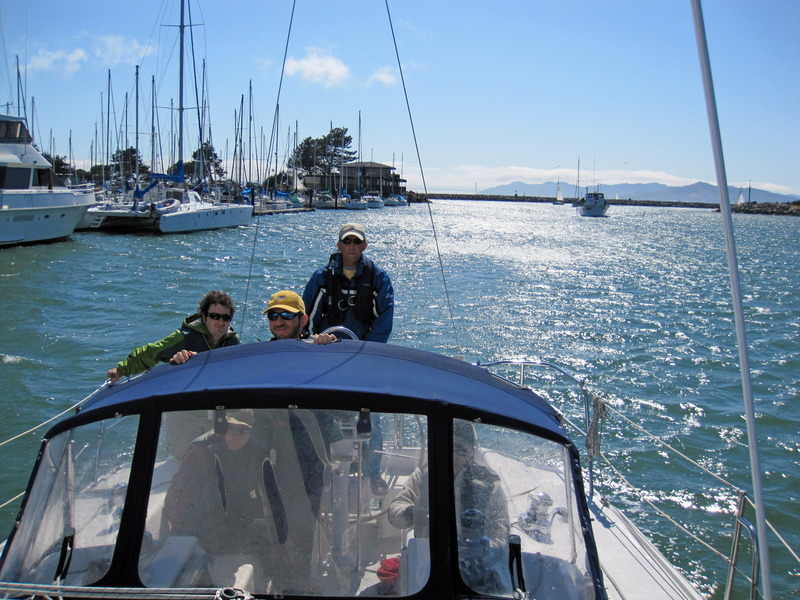 In the picture below we are "hove to" so we can have a quiet lunch behind angel island. Below is about the same picture as above, just a panorama of several pictures stitched together. Angel Island on the right, and San Francisco dead ahead of our bow. JM, Gleb, and Damon in the cockpit of our Catalina 32 Sailboat. Gleb, Damon, JM, Philip, and Miranda. Picture taken while standing in the cabin looking backwards on the sailboat. 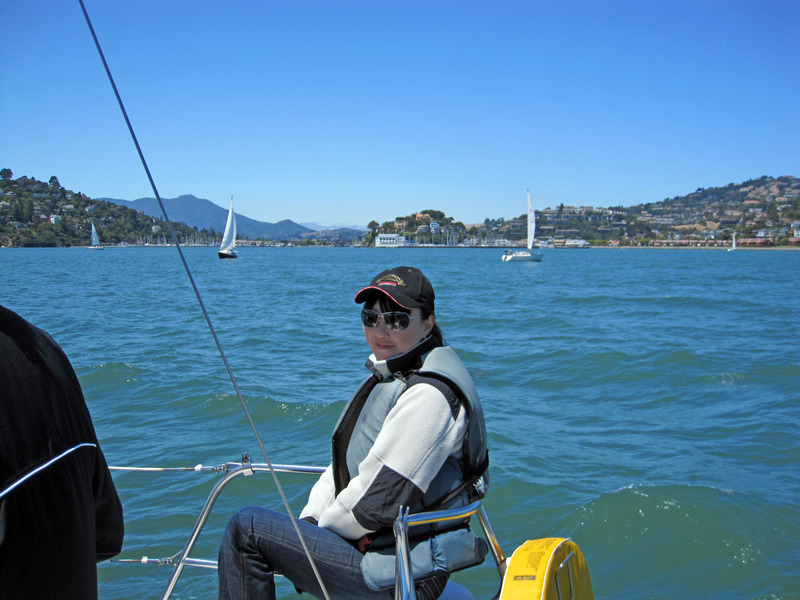 Katherine Chung sailing on San Francisco Bay. 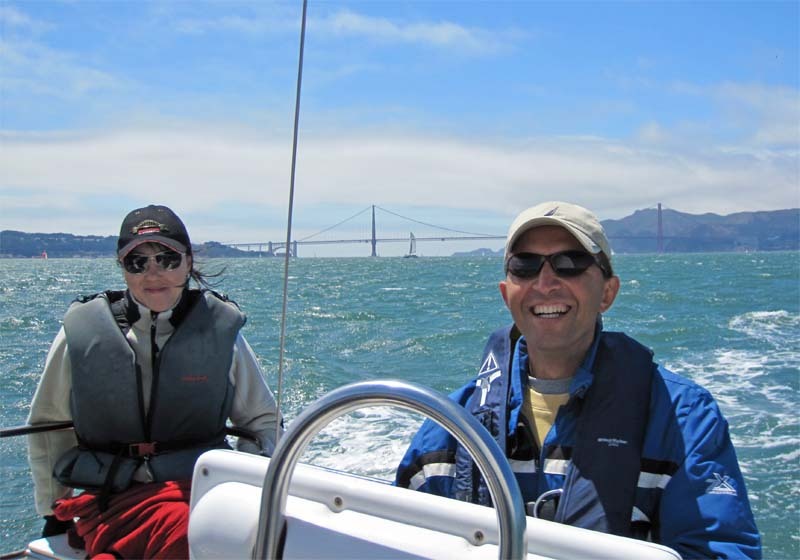 As we round Angel Island, we get a few views of the Golden Gate Bridge on this fine day of sailing in San Francisco Bay. Crossing in front of the Golden Gate, here is Philip relaxing with the Golden Gate Bridge in the background. 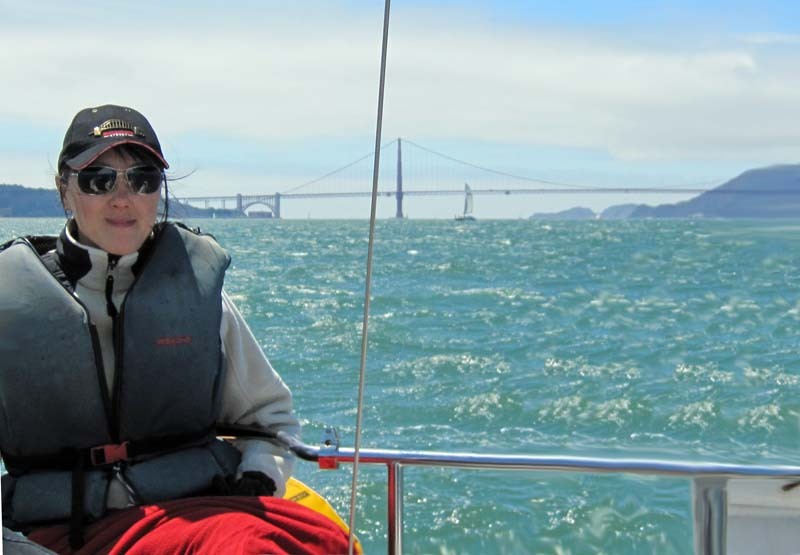 Katherine Chung sailing in front of the Golden Gate Bridge. Below is a minute and a half long YouTube video taken on the boat at various times. It isn't very exciting. :-) If you are on a Mac, click here for a high quality QuickTime Version. 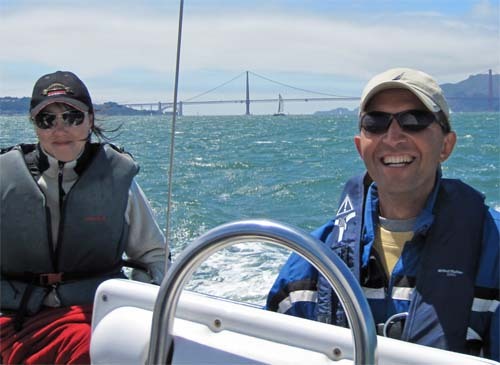 A nice picture of Katherine Chung and Jean-Michel Leon sailing in front of the Golden Gate Bridge. 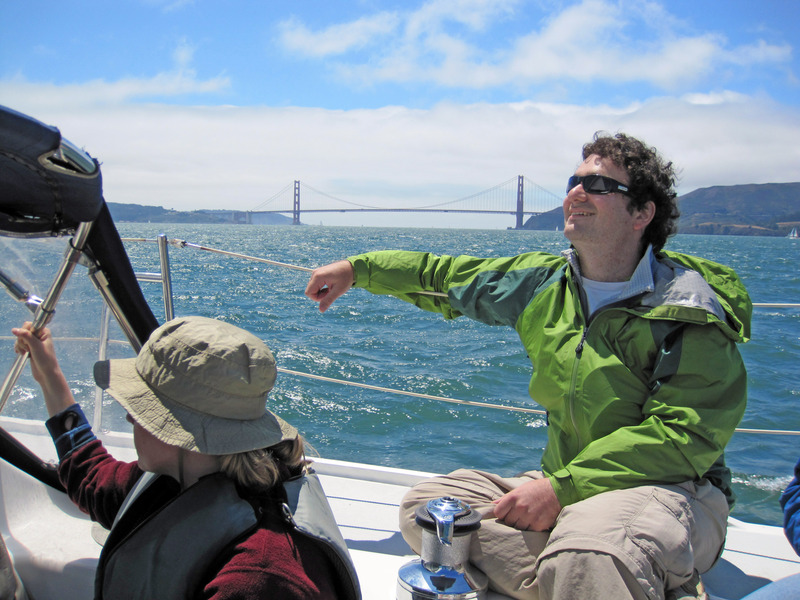 Below is a picture of a boat near us sailing between us and Alcatraz Island. 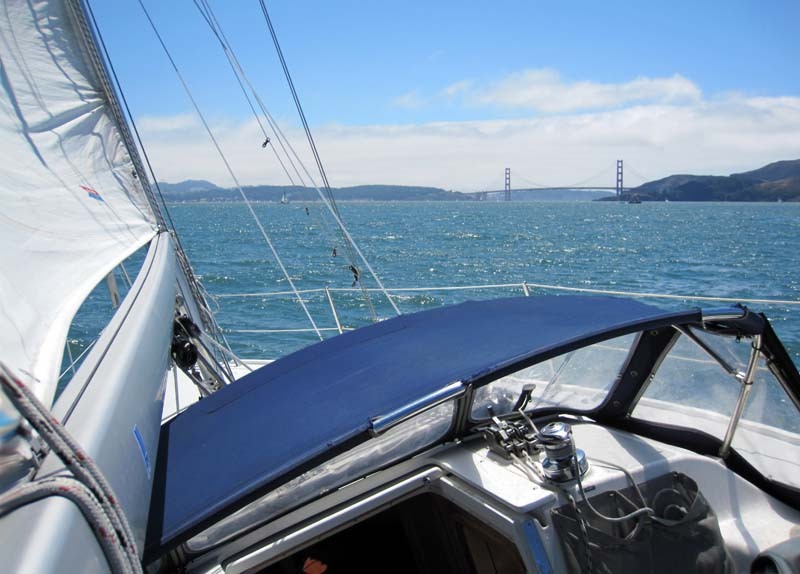 A close up of another sailboat having a nice day out in the bay with us. Finally, at the end of the day as the light gets flat we drop the sails and put-put back into our slip at the Berkeley Marina.